Pover is GUI interface for POV-Ray options. 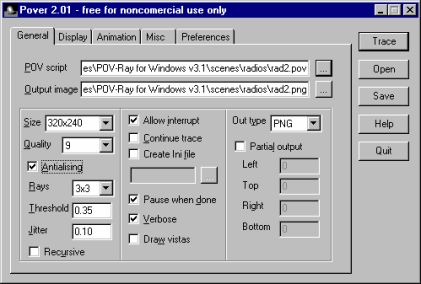 Program help's to change many options of POV-Ray Render. With Pover you can open and save configuration files for reuse it later. You can associate Pover with PCG files and get your work at one click. Pover may be runned in few instances and undemanding to system resources. At this moment application grow in two way. Unfortunately Windows version of Tcl interpreter has low speed. So i create native Windows program. Actual version of Pover for Windows is 2.03 (Win32). For versions early than 2.0 you may needed Tcl/Tk interpreter installed. If you don't have Tcl/Tk interpreter - you may get latest version on Scriptics page. In mind Tcl/Tk application should work's same way on Windows 9x/NT / Macintosh / Unix / OS/2 platform. But at this time it tested on Windows 9x/NT and Linux. On Linux you may also run Pover 2.03 through Wine in standalone mode (without needed Windows). If you plan to use this product in commercial environment, please register. If your browser not allow secure connections, please click here. pover.tgz archive of program for platform with installed Tcl/Tk (27 Kb). Copyright �1999-2002 Erny. All rights reserved.